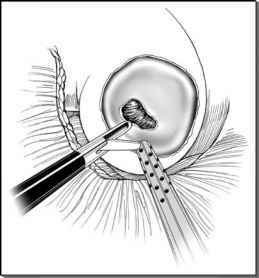 Precise entry into the collecting system is often necessary to provide a safe margin of resection during laparoscopic excision of intraparenchymal, deeply infiltrating tumors. Desai et al. (47) compared the perioperative data of 27 patients undergoing laparoscopic partial nephrectomy with pelvicalyceal entry (group I) with 37 patients undergoing laparoscopic partial nephrectomy with no pelvicalyceal entry (group II). Mean depth of parenchymal tumor invasion was 1.5 + 0.8 cm in group I and 0.9 + 0.3 cm in group II. Precise intraoperative localization of collecting system entry during laparoscopic partial nephrectomy was obtained by retrograde injection of dilute indigo carmine through a previously placed ureteral catheter. Mean warm ischemia time was longer in group I versus group II (30.2 vs. 19.4 minutes; p < 0.0001). Pelvicalyceal suture repair was associated with longer hospital stay (3 vs. 1.8 days; p = 0.003). No patient undergoing pelvicalyceal entry and suture repair developed urinary leak. The authors concluded that, although laparoscopic partial nephrectomy for a tumor extending up to the collecting involves freehand laparoscopic suturing, resulting in somewhat longer, although acceptable, warm ischemia time good outcomes can be expected with a low incidence of urinary leakage. Recently, Bove et al. (99) specifically evaluated the necessity of ureteral stenting for decreasing urinary leak after laparoscopic partial nephrectomy for single, localized, unilateral, sporadic, <4.5 cm renal tumors. Patients undergoing 5Fr open-ended ureteral catheter placement prior to laparoscopic partial nephrectomy (group I, n = 54) were compared with patients without ureteral catheter placement (group II, n = 49). Postoperative urinary leak (drain urinary output > 50 cm3per 24 hours) occurred in one patient in each group. In both these patients, the pelvicalyceal system had been suture-repaired intraoperatively during laparoscopic partial nephrectomy. Both urinary leaks were successfully managed conservatively with suction drains. The authors concluded that preoperative placement of a ureteral catheter for retrograde injection to identify collecting system entry was not routinely necessary (62). However, at the Cleveland Clinic, we continue to routinely employ a ureteral catheter because of the following reasons: (i) it is the only way to precisely identify the location of pelvicalyceal entry, (ii) occasionally, pelvicalyceal entry can occur at two different locations, which would be difficult to locate precisely without retrograde injection after one entry site has been repaired, and (iii) retrograde injection allows testing the water-tightness of pelvicalyceal suture repair. Alternative techniques of pelvicalyceal repair were proposed by other investigators, including sealing of the laparoscopic partial nephrectomy bed using oxidized regenerated cellulose mesh impregnated with gelatin resorcinol formaldehyde glue, and fibrin-impregnated hemostatic gauze or heat-activated tissue adhesive (54,61). In the former experience, postoperative urinoma occurred despite an indwelling double-J stent in 14% of patients; in the latter (a multi-institutional experience on 53 patients), 10% of patients who underwent laparoscopic partial nephrectomy required reintervention (nephrectomy, percutaneous drainage, or ureteral stenting) for postoperative urinoma formation (113).